WordPress hooks is one of the most powerful features available to developers. WordPress fires various hooks throughout the request cycle, allowing us to customize almost every aspect of it. There are two types of hooks in WordPress – actions and filters. Actions allow injecting custom functionality at different points of the code execution. Filters enable modifying the values of the variables at the different stages of the request cycle. This article is a continuation to the A visual guide to WordPress user registration hooks article, where we’ve dived into the WordPress user registration hooks. In this section we are going to discuss the login hooks that are fired by using the default WordPress login form, assuming a successful login. These apply for both the login form that is located at /wp-login.php and for any login forms that are generated by using the wp_login_form() function. Please note that if you are using a third party plugin for your login functionality, the hooks fired might be different. Additionally, WordPress allows plugins to overwrite some of the login functions, which could also change the default hook cycle. So, in this article we are going to focus on the default WordPress login hooks, assuming no modifications to the default functionality. The first request is the one that performs all the login-related actions, such as validation, authentication and setting up the authentication cookies. Once the login is successful and the authentication cookies are set, WordPress would return a 302 Redirect response, to redirect to a selected page. The second request is loading the redirected page. If you are using the default WordPress login form, the redirected page will be the admin dashboard, located at /wp-admin . Otherwise, if you are using the wp_login_form() function, you will be able to set a redirect page in its arguments. Or you can alternatively use the login_redirect filter that we are going to discuss later in this article. Now let’s go through each of these login actions and filters. We’ll start with the login request hooks. These two hooks are not actually related with the login process, however it’s important to visualize them, so you can understand where they stand in this process. The determine_current_user filter allows you to modify the current user that is set. The set_current_user action is triggered after the current user has been set. Here it is important to mention that these two hooks are triggered before the login authentication. Therefore in this request, if you attempt to get the current user ID by using the wp_get_current_user() function, the user ID will be set to 0. Also, the is_user_logged_in() function here will return false. The wp_authenticate action is triggered just before the user is authenticated. This action passes the username/email and the password as arguments by reference, which means that they can be modified from a callback. If you need to perform custom validation/authentication rules, one of the hooks that you can use is the authenticate filter. The default WordPress authentication is actually hooked to this filter. It is not called as function within the login process, but it is executed as a callback of the authenticate filter. Therefore if you are planning to use the authenticate filter, it’s important to understand how WordPress uses this filter. Use this hook with caution, as incorrect usage might mess up the default WordPress login functionality. The wp_authenticate_username_password and wp_authenticate_email_password callbacks include the main WordPress authentication functionality. They attempt to authenticate the user by username and email correspondingly. These two callbacks are hooked with a priority of 20. After that, the wp_authenticate_cookie callback is called with a priority of 30. If the username/password verification fails to authenticate the user, this function will check for the presence of an authentication cookie. The authenticate filter passes three arguments – user object, username and password. If you hook to this filter with priority smaller than 20, the user object will be set to null. However, you use a priority greater than 20, your code will be executed after the WordPress authentication. If the authentication is successful, then the user object will be set with the corresponding WP_User instance. If the last executed callback returns a WP_User instance, the authentication will be successful. However, if it returns null as a result, the authentication process will be terminated and the login will fail. To learn more about this hook, head over to the WordPress authenticate filter documentation. If you need to implement custom authentication rules, the priority to use will depend on what exactly you need to accomplish. If you need to add an additional authentication method, you would need to use a priority smaller than 20. That’s because the WordPress authentication callbacks will be executed only when the passed user object is set to null. And in this way, if your callback returns a user object, you will bypass the default WordPress authentication callbacks. If however, you need to strengthen your authentication and disallow logins based on some rules, you would need to use a priority greater than 30. For example, if you need to disallow login when the user signs in from a different device, you could use a callback with a higher priority and return null as a result. As you can see on the graphic above, the wp_authenticate_user filter is fired during the WordPress authentication process. This filter is called just after WordPress has performed the validation to check if a user exists with the given username or email. If a user with this username or email doesn’t exist, this hook will not be fired. It is also important to mention that this hook is fired before the password validation. Therefore, at the point of calling this hook, it is still not determined whether the authentication has been successful or not. This is another filter that you can use to apply custom validations. If your callback returns a WP_Error instance, the login process will be aborted. You can read more about this filter in the wp_authenticate_user guide. The auth_cookie filter is called after a successful authentication. You can use it to filter the authentication cookies. WordPress sets two authentication cookies – “auth” and “logged in”, and therefore the filter is called separately for each of them. The “auth” cookie is mainly used for authentication in the admin area. The “logged in” cookie, on the other hand, is used throughout the site to identify the logged in user. You can read more on the WordPress Cookies codex page. The authentication cookies are unique strings, that consist of the user’s username, cookie expiration date, a session token and a hash. It’s generally not recommended to modify this string unless you really know what you are doing. Also, if you need to modify it, consider using more specific filters. For example, if you need to change the expiration date, you could use the auth_cookie_expiration filter instead. Just after this filter, the set_auth_cookie and set_logged_in_cookie actions are also called, passing the cookie details as parameters. These actions are called just before the cookies are sent to the client. This filter is called immediately before the authentication and logged in cookies are set. If for some reason you need to prevent the cookies from being sent, you can use this filter. The filter sends a boolean true as an argument. If your callback returns false, the authentication cookies will not be set. Use this filter with caution, as an improper usage can lead to disabling the login functionality on your site. The wp_login action is called after a successful login. Therefore, if you need to perform a certain action only after a successful login, this is the hook that you can use. One important thing to mention is that if the send_auth_cookies filter is used to prevent sending the authentication cookies, the wp_login would still be triggered. The login_redirect filter allows you to change the page that the user is redirected to after a successful login. This is the final hook that is executed before redirecting the user after a successful login. 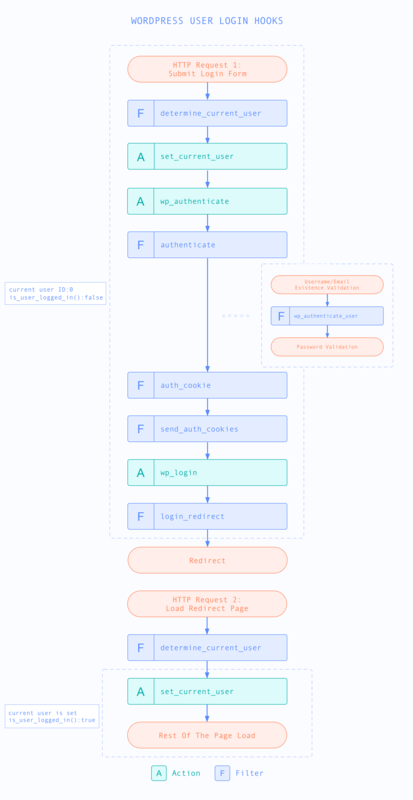 Now let’s take a look at the user-related hooks in the second request that performs the redirection. As you can see from the graphic above, WordPress calls the determine_current_user filter and the set_current_user action, just like on the previous request. These two hooks are actually called on every request. This time, however, if you hook to the set_current_user action, you will have access to the current user object. So, the set_current_user action in the redirection request is the first action where you can access the current user object after a successful sign in. By hooking to this action or any other actions/filters fired after it, you can now use functions like wp_get_current_user() to get the logged in user object. In this article we dived into some of the most important hooks that WordPress fires during a successful login process. As we already learned, the WordPress login process is quite complex and consists of many different elements. The two separate requests that WordPress makes can sometimes be confusing, especially when you to access the current user object. Therefore, if you need to modify the login functionality, it’s essential to understand how everything is pieced together, so you can choose the right hooks to accomplish your task. We hope you’ve found this article helpful, and see you again next time!